LAKE INN HOLIDAY GIFT CARD PROMOTION! 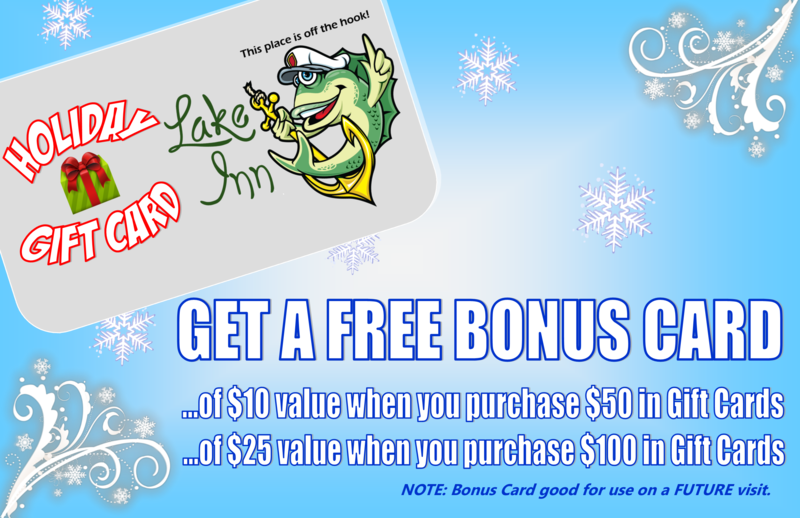 Buy $50.00 in Lake Inn Gift Cards and get an additional $10.00 “Bonus” card. Buy $100.00 in Lake Inn Gift Cards and get an additional $25.00 “Bonus” card. NOTE: You may divide your purchased amount up between several gift cards. Just be sure to enter instructions on where each card should be mailed to and in what denomination. Also note that there is a $2.50 processing fee for all orders. Once you fill out the form below and click “Submit”, you will be taken to PayPal where you can securely pay with a credit card to complete your transaction.